SparkoCam is a webcam and video effects software for broadcasting and applying live webcam effects to your video chats and recordings. 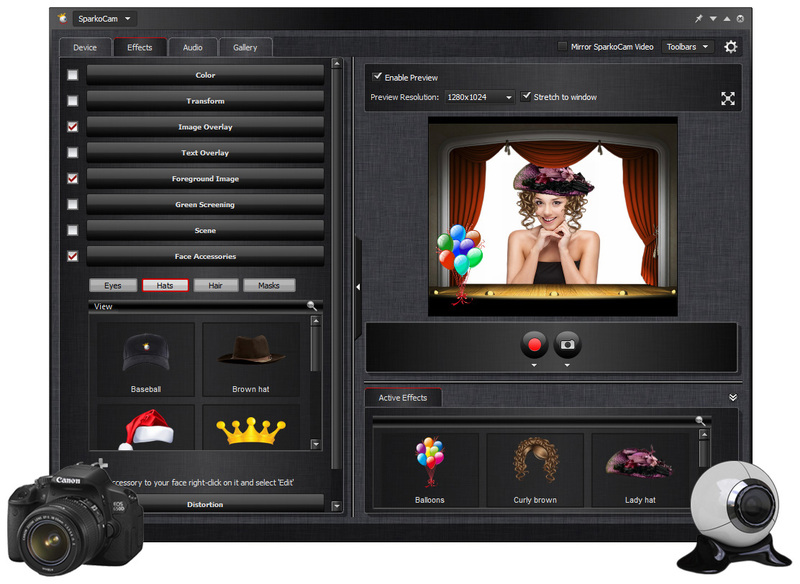 SparkoCam is an easy to use webcam and video effects software for broadcasting and applying live webcam effects to video chats and recordings. SparkoCam allows you to stream from various sources: you can use a regular USB web camera or Canon DSLR or Nikon DSLR camera, stream your desktop as webcam or import videos and photos from your computer and broadcast them like webcam feeds. After selecting a video source, it is possible to add amazing real-time effects and graphics to the video. You can add face accessories to your face like eyeglasses, hats, hair or masks and these accessories will be automatically placed in appropriate places on the video using SparkoCam's face tracking capability. With SparkoCam it is easy to add to the video fun animated objects or even create your own custom objects by importing PNG or GIF images. Additionally, you can use a green screening effect to replace your background with custom image or watch through anaglyph glasses and enjoy stereoscopic 3D effect. There are also funny distortion effects, frames and scenes where you can place your live video inside an image with outdoor screen or billboard on it. Enjoy with SparkoCam and new level of webcam functionality!